First things first – do you have your tickets yet? Cause you do not know it is selling out in some theaters. Yeah, order those tickets now. We suggest ordering them through Fandago. Why? 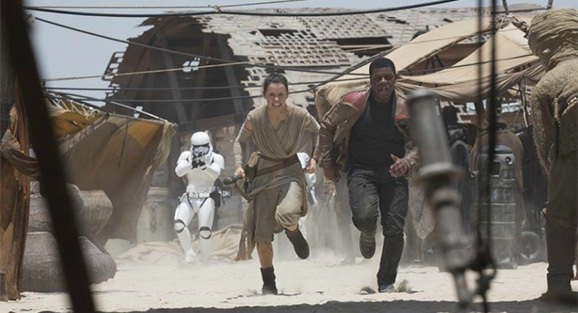 Click here for Fandango’s limited Edition Star Wars Gift Cards. A new gift card is revealed each week. Collect them while you can. Yeah, that’s kinda cool, right? Okay, now that you’ve got your tickets – it’s time to have a full re-watch of all the previous Star Wars movies. Yes, even the ones with Jar Jar. So, I know that there is a lot of discussion as to what’s the best order to watch all of the Star Wars movies. With that in mind, here at Giant Freakin Robot we want to share our Star Wars movies viewing order with you. Hopefully you’ll agree with our choices, but maybe not. Feel free to let us know your thoughts. I know that some people toss in the book series that are available or some of the animated series, but we’re sticking with just the movies. I mean, you have less than a week to work these in, so that’s plenty. Okay, so you’re all caught up on re-watching all the other Star Wars movies and you’ve ordered your tickets for opening night. Now, what the heck are you going to wear? Well, we’ve got a few idea for you. If you’re like me, then something like a hoodie is a better option for you since it is something that you can wear all the time. 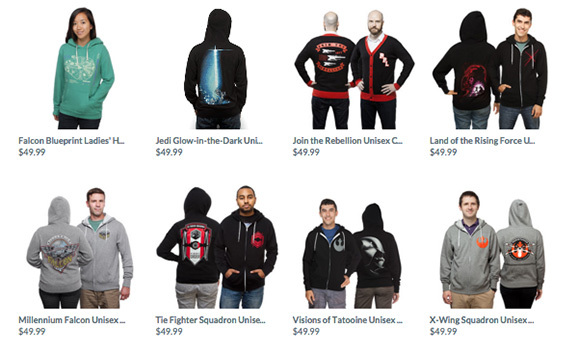 Well, there is no shortage of awesome Star Wars hoodie for you to check out. ThinkGeek has a few exclusives, but you can also find a good selection at Amazon. For Star Wars hoodies, click here for ThinkGeek or click here for Amazon. You might be thinking – “Dude, I don’t want to wear a blanket out to the movie theater.” But here’s the thing – not only is it freaking winter and cold outside, but it’s almost always too cold at the movie theater, too. So, with this kickass Jedi Robe blanket you get to stay warm, comfortable, and you get to have a pretty cool Star Wars costume. Since it is almost Christmas, then you may want to go with one of these ugly sweaters. Yup, you can buy Star Wars holiday sweaters. Fun, huh? Unfortunately, they are very popular, so you might have a hard time getting the right size. But if your heart is set on one of these, just keep checking back to see if your size is in-stock. Like the robe blanket above, this is another item that you can only buy at ThinkGeek. Click here to order yours now. Obviously, if you need to order any of these things to wear to the premiere, then you should probably do it TODAY so that it arrives in time.